I write about many things, some are known and some are unknown. My books always have a moral tale whether it be the end of the world or a new one just beginning. There are monsters in this world and there are angels. I try to pit them against each other and see who wins. As a journalist I write about current events, book reviews, or do character interviews with those characters I run into. I also write commentary where I express my opinion about world events. If you click on the more icon above you will find a drop down menu so you can visit my various book pages. I hope you enjoy them and please, stop by my blog and leave an opinion. No one is ever judged here. All opinions are welcome. Louann Carroll is a Native Californian living in the Sierra Nevada foothills with her husband Dennis. Mother to three children, she is an avid rock, fossil and gem hunter who enjoys sharing her finds with family and friends. She is a student of alternative religion, archaeology, anthropology and paleontology. After leaving her position as C.E.O. in the Bay Area she has pursued her writing career with much success. Winner of the 2010 Crescent Moon Press award for best novel and the 2015 Best Occult Writer award, she has gone on to write several more works that can best be described as sci-fi paranormal with a 'touch' of gothic horror. She is the author of the Gemini Rising series (recommended reads) A Shadow of Time, a paranormal romance, Shadowlands, Leanore's story, Journeys, The Adventure of Leaf, Innocent Blood, The Foundlings of Nirvana and numerous other stories and articles. She is also a Social Journalist and sits on the editorial board of Blasting News. If you like the paranormal and creepy haunted houses with a dark romantic twist, venture into the estate called Shadow Ley. Paranormal gifts and a calling from God pits one drug addict against the world. The child of genetic engineers wonders: what happens when the world you know comes to an end? ​A short read, normally free. Vampires to ghosts to monsters—and futures we won’t want to see come true—fill this collection of dark stories that are sure to give you chills. Will Kate become the bond mate she is meant to be? Will Noah find welcome with his people or will they despise him for taking the Light from their souls. Most important of all, will the prophecy of Lucia be fulfilled, or will Belial, demon of Hades, murder her in a fit of jealous rage? Do you enjoy reading and getting to know the authors who create your fictional worlds? Use this coloring book to fulfill your artistic side and relax while adding to your “To Be Read” list. Meet the authors you know and discover new ones. My name’s Jack and I had a great day today. I don’t always have great days. Sometimes they are good and sometimes not so good. When my alarm went off this morning, I thought it would be like every other day. You know, wake up, go to the bathroom, clean up, eat breakfast, fight with Jacob, go to school, go to practice, go home, do homework, eat dinner, fight with Jacob, get yelled at by the parents, watch TV, go to bed. That pretty much sums up most days. Above the earth and beyond the clouds lies the City of Wind. It is a special place where winds are born and named. 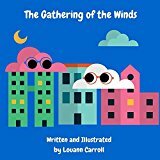 In the City of Wind, a small breeze learns how to become a gust and a gust a gale. Time comes in snurs and snips—a snur being more like a human month. This is Allison and Aanjay’s story. Allison is a warm dry breeze that hopes to flow down the side of a mountain someday. Aanjay supposes that his mountain might be in South Africa, or maybe Indonesia, or South America, or even North America if possible. Allison and Aanjay have rather lofty goals, but before either of them can become a part of earth’s winds, they must first make a choice and as everyone knows, choosing is hard. Follow Leaf as she leaves her tree, tumbling from adventure to adventure, learning much about friendship, courage, and life. Journeys explores spirit, rebirth, following one's own path, and finding the beautiful inner being in everyone. Illustrated by seventh graders, this is an interactive, inspiring story for people of all ages. Who is the go to dog when other animals are in trouble? Ever since baseball season began Rufus and Rascal's pet parents had given them little attention. The food bowl was empty and if that wasn’t bad enough the water bowl went dry this morning.